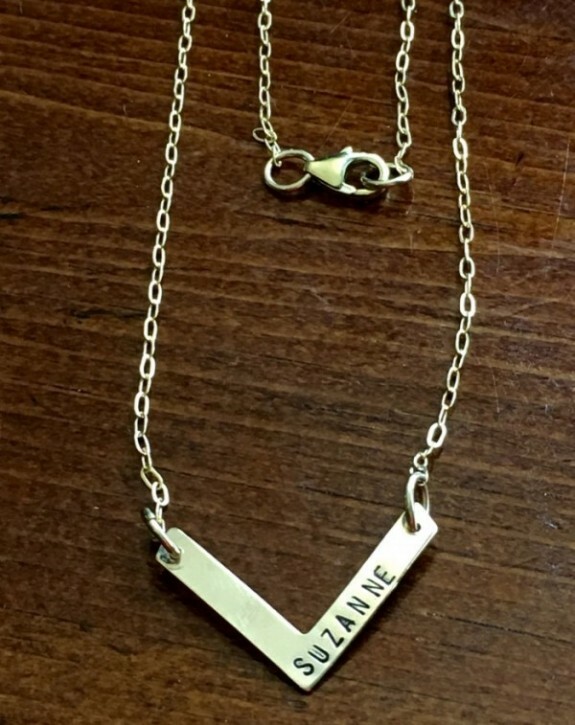 Gold chevron V necklace personalized with a name, initial or word- a simple and fashionable layering necklace to wear close to your heart. 14k gold-filled, sterling silver, hand stamped necklace measures 25mm x 16mm. Personalize with up to 11 letters. Categories: Classic Hand Stamped Necklaces, Gold, Graduation & Teacher Jewelry, Moms, Sisters, Aunts and Friend Gifts, Necklaces, new. Tags: chevron necklace, v necklace. Sterling silver ballet necklace is great dance jewelry gift for you a ballerina, dance instructor or coach to celebrate a recital, performance or competition. Sterling silver necklace. 16″ Chain. Beautiful pair of personalized earrings in sterling silver. Customize with your initial or monogram- perfect gift for an anniversary, graduation, bridesmaid or special occasion. Sterling silver, hand stamped earrings. Personalized charm measures 1/2″.